Three family members on a hunting trip in remote woods become hunted by a trio of masked gunmen. Brothers Mike and Sean Neary take Mike’s wife Wit with them on a hunting trip at a remote nature preservation where they used to go as young boys. After leaving their car and setting off into the woods, they spray-paint a tree with a smiley face to mark their path. Having never hunted before, Wit is hesitant to actually kill a deer. The first evening winds down with Wit and Sean playing Truth or Dare while Mike continues to take distracting cell phone calls from his office. In the morning, the trio wakes to find that all of their gear has been stolen and black X’s have been drawn on their foreheads. With Sean being a former Marine suffering from PTSD, Mike suspects that his brother is responsible. Sean examines the tracks and determines that they were robbed by three people. After an argument amongst the three of them that results in Wit telling her husband she is pregnant, Sean has Mike and Wit look for the path back to the car while he searches the forest for his dog Buck. Sean finds Buck’s dead carcass hanging from a tree before a gunman fires at him. Sean sneaks into the sniper’s nest and attacks the masked gunman, but the gunman recovers and stabs Mike in his stomach. Mike and Wit find an entire copse of trees spray-painted with smiley faces and realize they are lost. Dehydrated, Mike finds a bundle of water bottles hanging from a tree and ends up putting his foot in an animal trap. He and Wit find a ranger station where Wit is able to bandage his wounds. Having discovered a map in the ranger’s office, the couple creates a plan where Wit looks for the path to their car while Mike distracts their pursuers. Mike lures a gunman into a portable toilet and subdues him, but a second gunman appears as Mike exits and shoots Mike in the back. Wit scales a cliff and contacts Mike via walkie-talkie. Mike warns Wit that she is going to have to kill the people hunting her just before he drops dead in a dumpster where he has been placed alongside Sean’s body. Wit discovers that the attackers are masked boys on bicycles when they track her using the GPS locater that Mike put on her earlier. Wit drops the tracking device and flees. While the boys search for her, Wit makes it back to the car, but discovers it has been sabotaged. She stitches up her wounds and begins preparing herself for the fight ahead. Jack, Will, and Ben communicate with each other solely through text messages. When one of the boys insists on going home to avoid trouble with his parents, another boy dunks his face in the lake to force him to stay until the end of their hunt. Wit begins hunting the kids and takes out the first one with a tire iron. She lures the second boy to the preservation’s Nature Kid’s Museum and shoots him following a standoff. Using that boy’s phone, Wit lures the last boy to a clearing and attempts to take him down, but he ultimately knocks Wit unconscious and drags her with his bike to another location. Wit wakes to find herself restrained on a picnic table. The boy prepares to stab Wit in the stomach, but he is distracted by a phone call from his mother. Wit uses the opportunity to escape. The boy gives chase and their final confrontation ends with Wit stabbing him in the neck with a broken beer bottle left behind earlier by Mike. Wit takes one of the boys’ bicycles and rides calmly back into town. Brothers Sean and Mike Neary took two separate roads in life. Mike went to business school and came back with an MBA and a proclivity for chewing out hedge fund managers over the phone. Sean went to the Middle East and came back with a thousand-yard stare and an uneasy smile. Accompanied by Mike’s wife Wit, the two brothers backtrack along their divergent paths for a reconnecting weekend at the remote woodland nature preservation where pop taught them to hunt as children. Their car engine has not yet cooled when “Preservation” starts setting the stage for what looks like a typical love triangle thriller. Wit secretly frustrates herself with a pregnancy test in the bathroom. From the look on her face, she isn’t pleased by the result. Mike marginalizes his wife at every opportunity, whether it is taking business calls at inopportune moments or putting a GPS tracker on Wit’s necklace the same way he did on the dog’s collar. And the mutually acknowledged furtive glances Sean sends in Wit’s direction suggest Mike doesn’t deserve her, and Sean may have already staked his claim. A tug-of-war between two brothers, one an alpha male made unstable by the horrors of war, one a clean-cut square focused on fulfilling his American Dream, with their conflicted, keeps-to-herself paramour caught in between. Alone in the woods with hunting rifles in hand, “Preservation” puts on an appearance of heading in a predictable direction where each point of the triangle is prepared to burst from their shells as soon as the right fuse is lit. Although the tale told ends up with a tone of familiarity, it turns out to be not exactly this same one telegraphed by the first act. Which is certainly not to say that “Preservation” avoids foreshadowing its actual plot well in advance. Sean is never at a loss for hunting metaphors as he and Mike school Wit in the finer points of first-time deer shooting. When not waxing wise about what a hunt can awaken inside the hunter, Sean makes mention of how bears kill as a defensive reaction, lions kill because they are hungry, and man is the only animal that kills for fun. Just in case the movie’s central theme is not yet firmly nailed between the viewer’s eyes, Sean also goes on to recount the Greek myth of Artemis, whose legendary bow-and-arrow encounter with a bear ultimately turned her into a god. What “Preservation” turns into is a “Deliverance”-styled survival thriller fused with an outdoor form of home invasion horror. The simmering Neary family menace-a-trois is prevented from reaching a full boil when three silent boys in homemade skull masks steal the guns, the gear, and make the Nearys the noobs in a real-life game of Team Deathmatch. As derivative as the preceding description might sound, a rote roster reading as initially dull due to straightforward characterizations redeems itself through full-bodied portrayals as the story rolls. An accomplished actor himself, writer/director Christopher Denham is well versed in shaping performances capable of transcending their types. His range of experience from Martin Scorsese’s “Shutter Island” and Ben Affleck’s “Argo” to more boutique projects like “Sound of My Voice” has given Denham a keen eye for pulling tone from his cast and putting it back into the scene. As the Neary Family trio, Wrenn Schmidt, Aaron Staton, and Pablo Schreiber work their parts with the sincerity of a stage play. That doesn’t mean overdramatic or unnecessary theatrics, but rather intimately engaged connections with one another that radiate across to the audience. The acting quality alone makes “Preservation” consistently engaging. The issue cutting down “Preservation” is the typhoon swirl of similar films crowding the genre market. In the past two years, I have written both “trip/holiday/vacation becomes a fight for survival” and “masked intruders terrorize (fill in the blank)” as plot summaries for seemingly countless reviews. Movies featuring colorfully-disguised thrill killers and themes of summoning inner strength for survival have become so commonplace that they have practically elbowed “found footage” asylum investigations out of the “most overdone” spotlight. “The Strangers,” “You’re Next” (review here), “Torment” (review here), and “Berkshire County” (review here) already adequately cover one side. “Black Rock” (review here), “Eden Lake,” “A Lonely Place to Die,” and others whose names I cannot recall because they blend together cover the other. The unfortunate shame for “Preservation” is that it is presented with precision, and produced as expertly as any of the aforementioned films. The naturally lit forest setting feels unsettlingly claustrophobic despite the open-air environment. Editing is razor sharp and the music suits the uncomfortable mood. But a fumbled subtext that may or may not be commenting on children and romanticized gun violence, or depicting a disconnect between modern technology and human empathy, comes with the sensation that Denham is misusing an arsenal of talent and context that is above the movie he ends up making. “Preservation” does exactly what this sort of film is supposed to do. It prompts the audience to feel the plight of the protagonists while licking their lips in anticipation of apathetic attackers finally receiving their just comeuppance. The tension and suspense are always palpable, yet so is the redundancy. 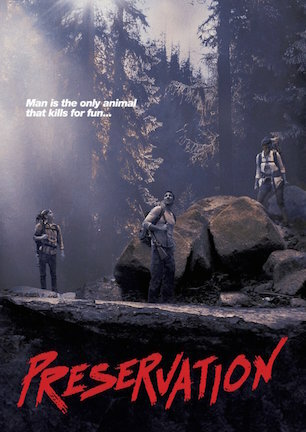 “Preservation” is a tightly executed take on the hunted becomes the hunter theme, but there is no getting around the nagging notion of having seen this same scenario several times before.